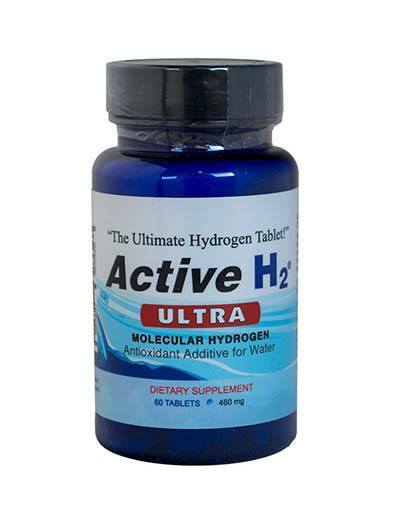 Active H2 Ultra is an all-natural Hydrogen Antioxidant tablet that has a combination of magnesium and supporting natural substances as the only active ingredients. This antioxidant additive for water generates significantly greater amounts of Molecular Hydrogen (up to 7.5 ppm) and a powerful electron-rich potential (-ORP)! Active H2® ULTRA tablets are the latest advancement for introducing the amazing properties of Molecular Hydrogen to drinking water. These tablets provide abundant and effective Hydrogen molecules that are uniquely found in fresh, raw, living foods and are essential to any serious antioxidation program. The natural, proven Active H2® ULTRA molecular hydrogen supplementation formula consists of a proprietary blend of pure magnesium metal, dl-malic acid, dextrose, tartaric acid, and stearic acid that act synergistically in water to generate Molecular Hydrogen and electron-rich potential (-ORP). Magnesium – As one of the most vital dietary minerals, it is a required cofactor in more than 800 enzymes used in the human body. A government study confirms that 68% of Americans are deficient in magnesium. One tablet provides 60 mg of magnesium. Metallic magnesium in the tablet reacts with malic acid and water to produce magnesium malate and hydrogen gas. Malic Acid – This natural molecule is also produced within the mitochondria (the cell’s energy source). Malic acid supports the body’s energy reserves while improving mental clarity and reversing muscle fatigue. Dextrose – A common binder used in the supplement and pharmaceutical industries. Binders are added to tablet formulations to add cohesiveness to powders and provide the necessary bonding to form a compact tablet mass. Tartaric Acid – Tartaric acid is a naturally occurring organic acid contained in foods such as grapes, apricots, and apples. It acts as both an antioxidant and an anti-inflammatory. It can substantially increase the rate at which nutrients are absorbed into the bloodstream. Tartaric acid has been used in combination with malic acid to produce effervescence which helps to cause quick dissolution of tablets. Stearic acid – A natural waxy oil commonly found in vegetables, fruits, and other foods. It acts as a lubricant in tablet making and is used as an ingredient that helps tablets hold together and break apart properly. 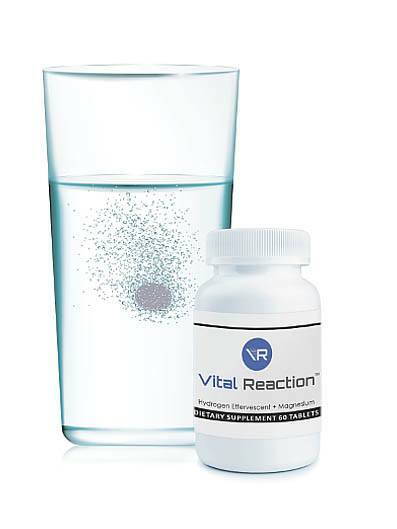 The all-natural, add-in tablet provides Molecular Hydrogen in the amount of up to 7.5 ppm in your container of water. -700 mV ORP in 1 liter of pure water! You can drink it as soon as the tablet dissolves – thereby getting greater amount of hydrogen than in tablets that take longer to dissolve. Place one (1) tablet of Active H2® ULTRA in a container/glass with 8 -12 oz of pure water or non-carbonated juice/liquid, or as recommended by a professional health practitioner. Wait until the tablet is completely dissolved (less than 1 minute) before consuming. We recommend that you drink it as soon to possible in order to ingest the highest amount of hydrogen. A one pint glass mason jar or clear glass work well as containers that allow you to see the tablet dissolve and know when it is ready to drink. Consider the level of stress and/or physical activity that is expected as well as the duration of the activity. Active H2® ULTRA hydrating drinks are especially beneficial for endurance sports like running marathons, cycling, climbing, etc. You can take up to 4 (or more) tablets daily if you are especially active.